The average cost of a wedding dress in the United States is1200 dollars, but this does not mean that do not produce a huge amount of dresses that cost tens or hundreds of times greater than the figure in the world. 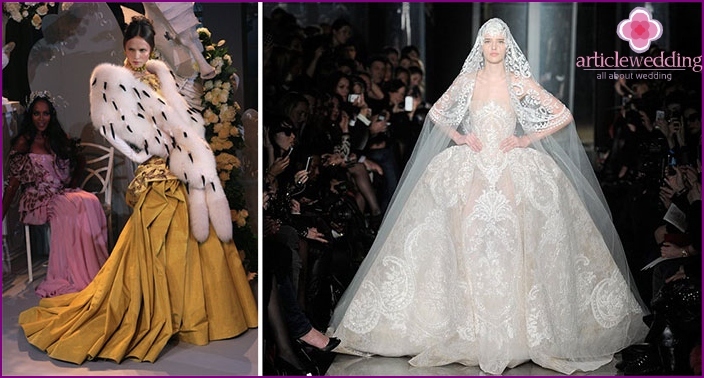 Here are ten of the most expensive wedding dresses in the world, designed by famous designers. Their cost ranges from 50 thousand to 12 million dollars. The most expensive wedding dress in the world -joint creation of designer Renee Strauss and jeweler Martin Katz. 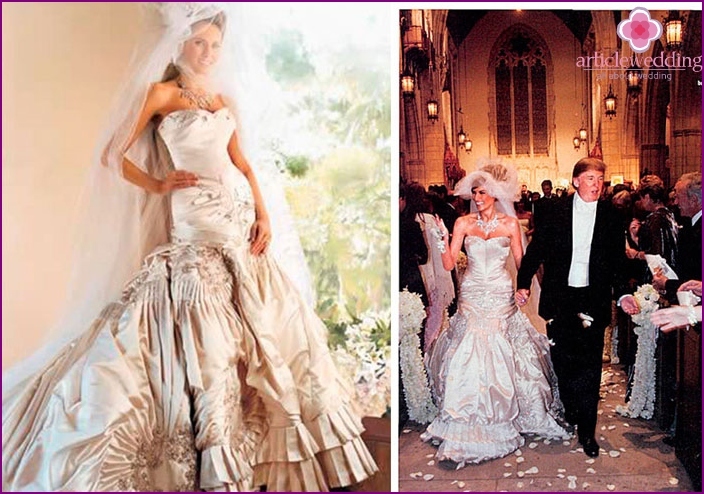 This masterpiece has been shown to the public in February 2006, the show-show wedding suits in Los Angeles. The dress was sewn in a single copy, and, in spite of its beauty and originality, outfit still no one bought. Tight-fitting cut emphasizes the figurebride, so the dress will look good only on the girl with the perfectly proportioned - lush breasts and a narrow waist. Open the bodice of this model is lavishly decorated with white diamonds of the same size, which provided a wedding garment such a high price - $ 12 million. Attire recognized as the most expensive in the entire history of fashion. 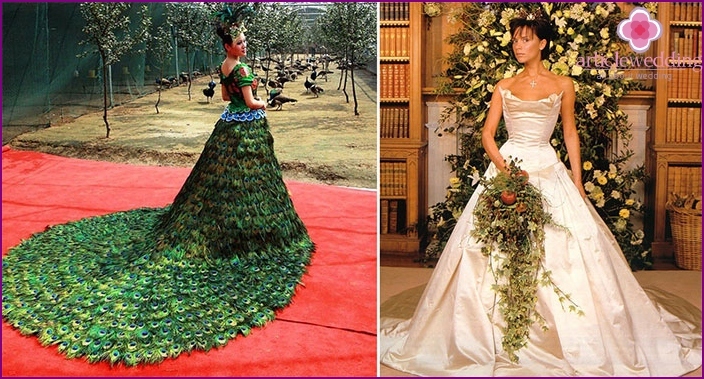 The second place took the most expensive luxurywedding dress from the world-famous Japanese designer Yumi Katsura. Wedding dress, the price of which is equal to 8.5 million dollars, strewn with exactly one thousand fine pearls. As a jewelry designer and green and gold diamonds were used. The bold shape of wedding apparel is designed for fans of short dresses and doll style. 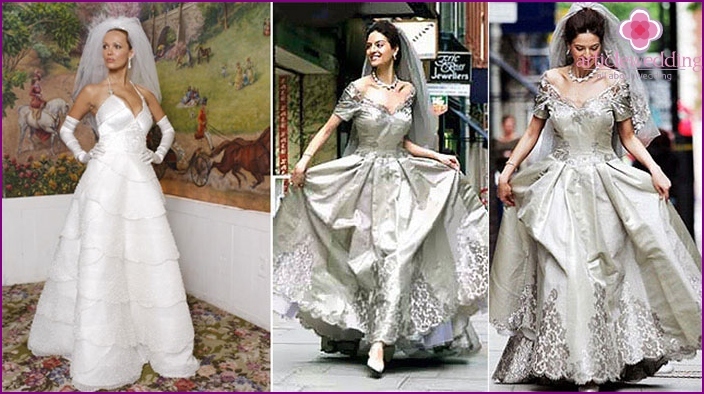 In 2000, a model of a wedding dressBritish fashion designer Mary Grahfogel was a real revelation to the world of fashion. The dress was one of the first truly chic outfits of modern fashion. He presented the famous model Jodie Kidd. Moreover, under the terms of the insurance, she could wear a dress only in "safe" areas, which are pre-determined by the organizers of the shows and photo shoots. As soon as the model took off the precious outfit, he was taken away for storage in the safe. Black wedding dress has a front piquantslit to the thigh, and the back is decorated with a skirt falling to the floor in the form of a fish tail. Silk corset studded with 2000 diamonds. The starting price, which was scheduled for this outfit, was $ 500 thousand, but later sold it for $ 1.8 million. 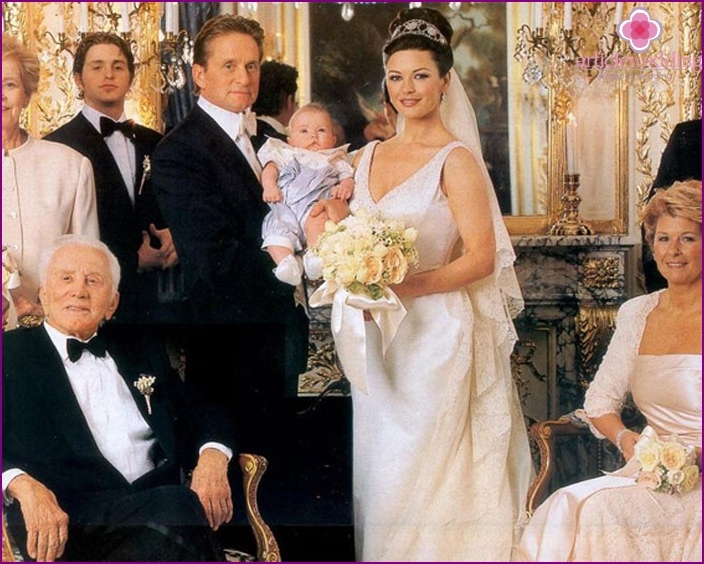 Hollywood star Catherine Zeta-Jones wascompelling bride at the wedding to Michael Douglas. The future husband gave his beloved wedding dress designed by Christian Lacroix. 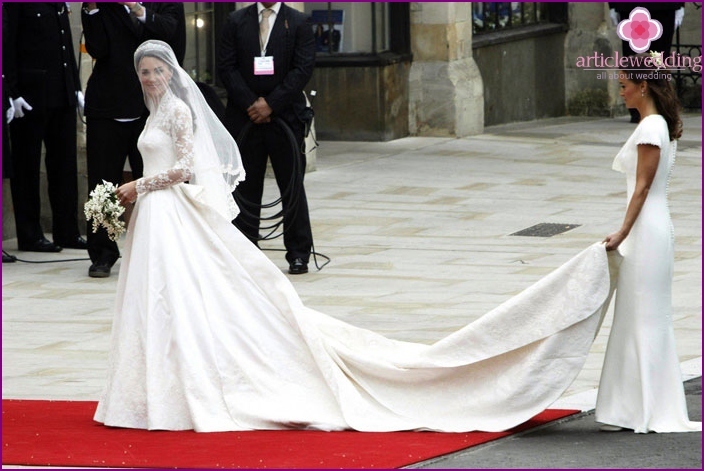 Douglas wedding dress cost a half million dollars. The audience was fascinated for a long time discussing the long snow-white robe with a magical train that was the actress in the day of the wedding ceremony. American brand sewed expensive wedding dressanonymous customer. As it turned out, it was created for the 23-year-old bride from the UAE. Attire shilsya customized in an exclusive copy. For this 45 meter organza was used, and as an adornment attire strewn with 1100 diamonds weighing three hundred carats and 3,000 Swarovski crystals (crystal stones are special 12-sided cut that mimic diamonds). Price products accounted for $ 300 000. Presented at a fashion show in the Bunka Fashioncollege (Tokyo) jeweler Ginza Tanaka, a wedding dress is decorated with 15,000 Australian gold coins. Costume weighs ten kilograms and is worth more than 250 thousand dollars. At the show were presented and other "golden" model, for example, jackets, which weighed more - about 15 kg. The talented Japanese surprised the audience magnificent and extravagant outfits of gold. The price of each piece of Christian Dior,presented in 2007 on the show Fashion Week, it was not less than $ 200 thousand. One dress bought immediately after the show. Luxury wedding dresses of multicolored tissue literally chained to his views of all the participants. After the collection, the original wedding dress for a long time been at the center of discussions, fashion critics. 200 thousand dollars paid for the weddingapparel Dior model Melanie Krauss. In the spring of 2005, she married Donald Trump. The girl picked up a long dress for the wedding ceremony with the famous billionaire and stopped at a beautiful model Christian Dior Couture collection. To sew a satin garment handmade took 90 meters of fabric. Open top successfully contrasted with surroundbottom, and the hem of a wedding suit and elegant air plume attracted bride admiring glances guests. Leaf garment was decorated with silver - it is so weighted thing, which demonstrated that the wedding dress model at the show literally collapsed under such a load. However, Melanie was able to walk to the altar without incidents. 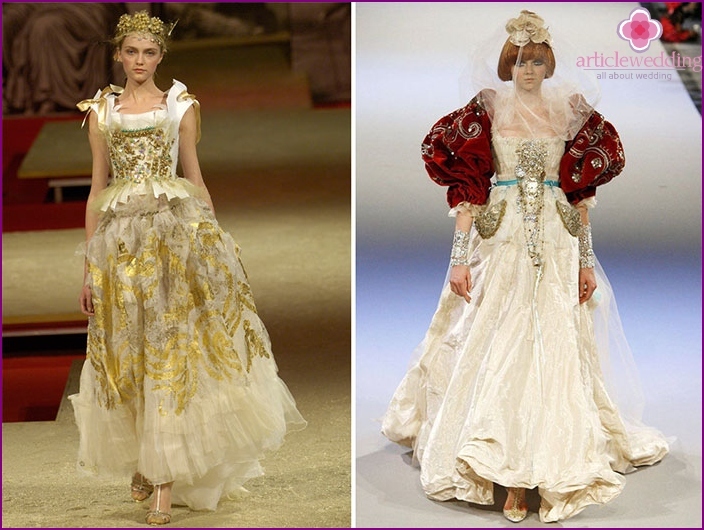 Christian Lacroix in 2005 introduced a generalattention gorgeous wedding dress cream-colored, decorated with gold-colored accents and a veil crown replaced with natural pearls. The dress of chiffon surpassed all expectations of representatives of the fashion world. Magical wedding dress deserves to be called a work of art. Until now, dreaming about it, millions of girls around the world. The cost of a wedding suit is estimated at $ 150 thousand. At their wedding in 2001. Jennifer Lopez was inbeautiful dress for 50 000 dollars. The author of the dress has become the eminent Italian designer Valentino. 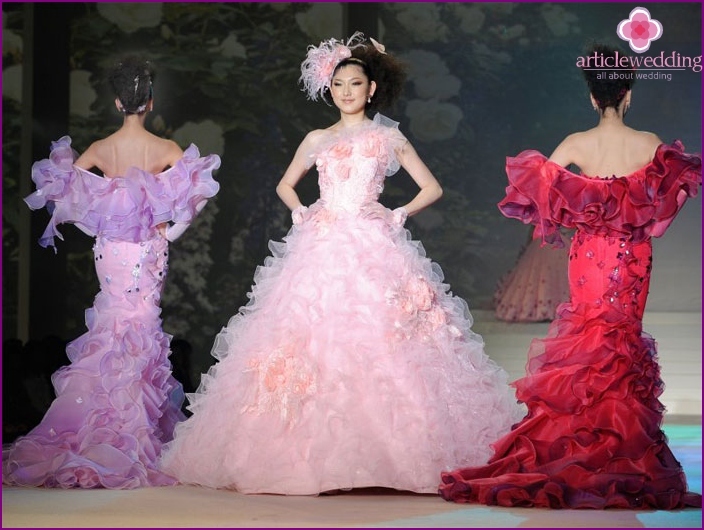 At the time of the marriage ceremony dress is standing among the most expensive among the ever created. Then the stars were just beginning to compete on the cost of wedding dresses. And dress Lopez was declared leader. Translucent sleeves, neckline frank,figure-fitting silhouette, light veil - in a delicate white dress bride was beautiful. Twelve years later, the singer's wedding attire from Latin America has not lost its relevance. Many women are still bought wedding dresses of this style. And no wonder, because the versatile cut for any shape, making delightfully beautiful bride. 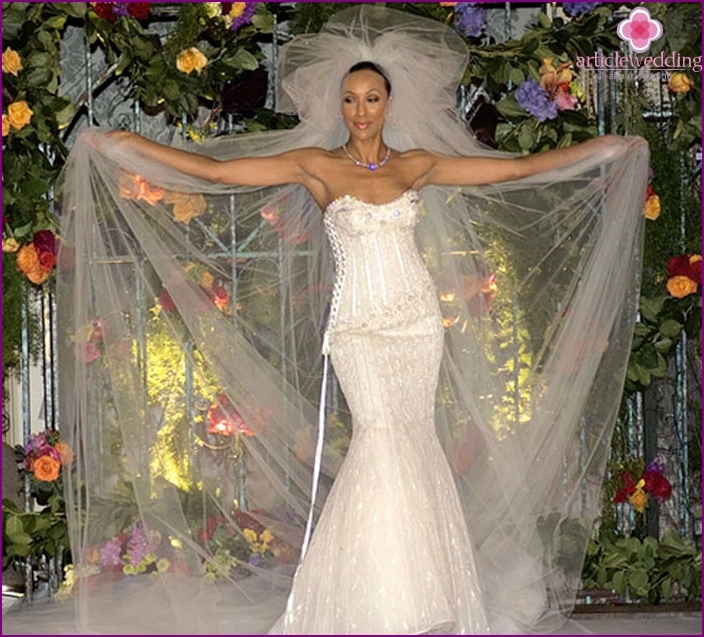 Any wedding dress presented by well-knownfashion house, will have a high price. However, the name of the famous fashion designer - this is not the only thing that affects the formation of prices. The high cost of wedding attire is justified by the presence of original jewelry: Swarovski crystals, lace, jewels. Dear translucent lightweight materials, sophisticated exclusive cut, renovated cause such a high price most luxurious wedding dresses, photos of which you can see below.